Early on in the process of becoming a volunteer, during the initial pre-service training, the program staff review each volunteer’s general background, work experience and evaluate their practicum performance in-country. Bouncing this information off of a brief survey each volunteer completes, they begin to make the important decisions surrounding each volunteer’s future service. Namely, review of the compiled data dictates not only the best possible site match but also what grade levels a TEFL volunteer will be teaching. For one reason or another, when the steam was cleared from my bubbling caldron of analytics, the bones and tea leaves read “High School.” Not without its merits, the experience of teaching at the high school level has been interesting, certainly with its ups and downs, but that is for another blog post. In this installment, I step through the wardrobe into the magical land of the little people, full of rainbows, fairies, spiriduși and juice boxes. 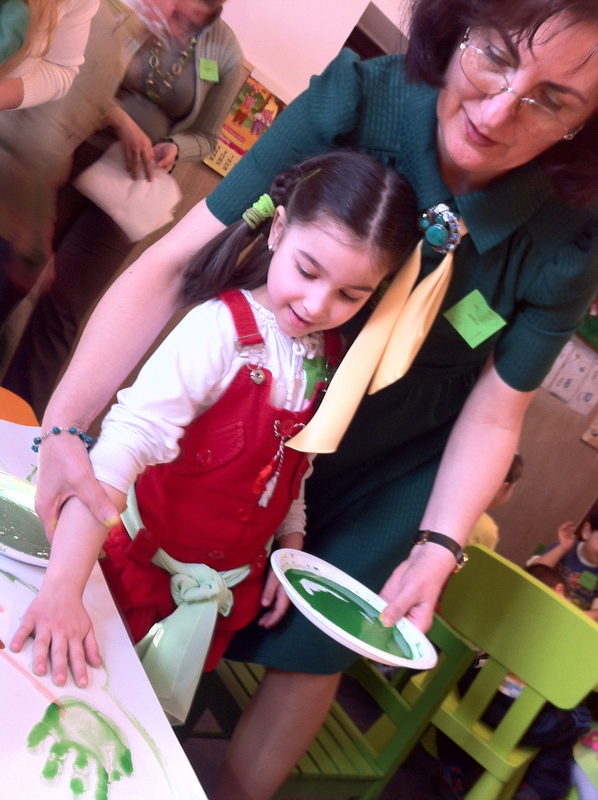 The young daughter of my Romanian Counterpart attends a small kindergarten in the heart of Ploiești. Situated in an interesting, multi-story building that is likely a converted house, it’s complete with a swing set and jungle gym in the front yard and a family guard dog. The school caters not only to very young preschoolers but also offers afterschool daycare services for grade school students with active parents. With every inch of wall space adorned by educational material or student artwork, the facility is tidy, well organized and run by a very friendly, welcoming and capable staff. My Counterpart’s friendship with the owner and director of the kindergarten goes back many years, so when it was time to enroll her own daughter in such a facility the choice was obvious and easy. It was through this friendship that the kindergarten director found out about the new American volunteer and where the idea was hatched to have him come and work with the kindergarteners in his free time. Just as the winter snow began to melt and the symbolic ghiocei flowers were popping up everywhere, the seed for this project was beginning to sprout. During a preliminary meeting in Ploiești, over customary Turkish style coffee and sweet pastries, it was decided that the timing would be perfect for a Saint Patrick’s Day lesson. With my normal school schedule being the lightest on Tuesdays, March 20th was picked as the most convenient for all those involved and thus began the brainstorming. This is where I really became impressed by the little kindergarten; when first asked to participate in this project, I figured it would be like one of my normal high school classes, where the resources are limited, the students only sheepishly engaged and the teachers worn from years of salary stagnation and increasing mounds of responsibility. Refreshingly, the forthcoming experience could not have been further from the grim truth of high school. The Director and teachers (let alone the usual exuberance of my counterpart) were highly engaged, enthusiastic and incredibly creative. Building off the ideas I liberated from MES-English.com, my “go to” resource for lesson planning materials, we came up with a full morning of fun activities for the students. Early on the morning of March 20th, I chugged down my morning coffee and ran for the next Maxi-Taxi to Ploiești and the rendezvous point where I was to meet my counterpart for a ride to the kindergarten. As I hopped in the car, my counterpart’s daughter greeted me from the back seat with the coached “Good Morning Jeremy” to which I have become happily accustomed. Fascinated with her mother’s American colleague, we fashioned a little competition, where by the end of my stay in Romania one of us is sufficiently fluent in the other’s respective language to hold a conversation. Although I have been given an unfair head start in language proficiency, thanks to Peace Corps training, and even though her English is currently, though understandably, limited to a kindergartener’s level of colors, numbers and simple greetings, I have every confidence that her young, sponge-like brain, and sheer tenacity will prevail. Regardless, I responded in kind with a warm “Bună dimineața” as we were whisked off to her kindergarten. Arriving among the hurricane-like hustle and bustle of kindergarteners getting ready for the day’s lesson, we got set up and sipped our last coffee before getting underway. The school was a flurry of green everywhere; from student’s attire, complete with shamrock nametags, to decorations on the wall, even I sported a kelly-green t-shirt (Portlandia) under my grey blazer. They even had green apple juice on hand during snack time. 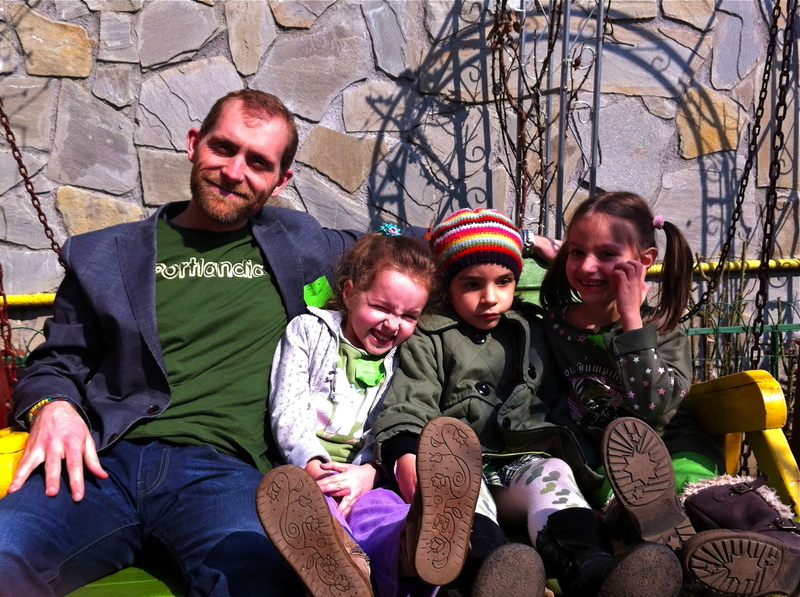 Sticking to our schedule, another positive idiosyncrasy of this kindergarten when compared to high school, we kicked things off with a short story, read aloud in Romanian about the history of Saint Patrick’s Day. We then followed this up with a short cartoon about the holiday that we pulled from the YouTube. Then, with attentive eyes and craned necks staring up at me, it was my turn to present a quick English vocabulary lesson. Relying on the same techniques I use in high school, I fired up the iPad and went through a series of picture flashcards that I pulled from MES-English.com. As instructed during pre-service training, I went through the set of slides four times. First slowly showing each image and stating the vocabulary word twice with the students listening in silence, then the second time through I restated the words and had the students repeat after me. The third time through I presented each image again in order, this time saying two different words, giving them the option of a correct one and incorrect one, from which they had to choose. Then, for the last run through, the students had to pronounce the correct word for each slide without help. Although vastly more attentive than my high school students, the final round was understandably a little challenging for the little tikes, with many a blank stare at the “Leprechaun” flashcard. Next, to fortify what they had learned, we played the time-honored classic of Bingo. Each of the 25 kids was given a handful of green paper chips and a game card with uniquely placed images matching the flashcards they had just learned. Additionally, I took printed copies of the flashcards and arranged them magnetically to a small whiteboard so that as I called out the vocabulary in English I could still help them along by referring to the picture on the board. After a few Romanian instructions we played several rounds, each more successful than the previous as the students stopped exuberantly yelling “Bingo!” each time they had one match, not the requisite three in a row. 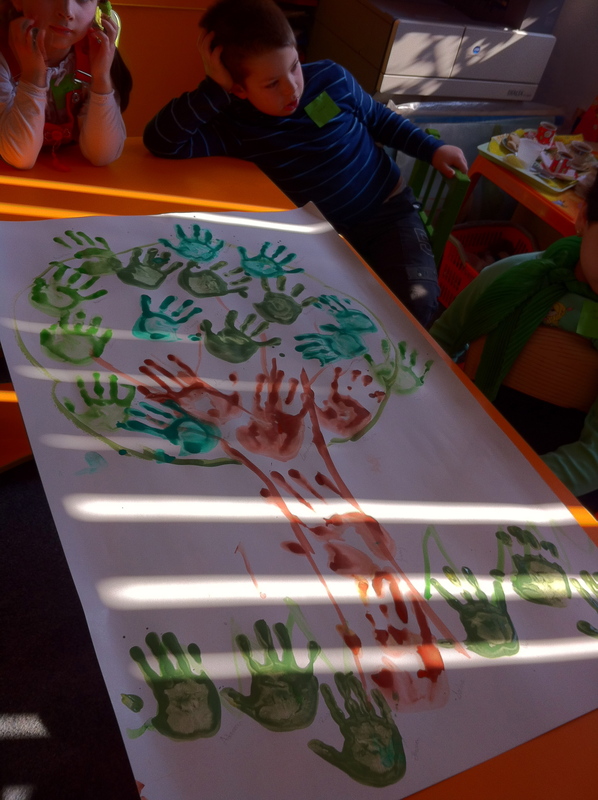 After the English lesson, the school’s staff began mixing water-based paints for the creation of what I think we called a “Learning Tree.” The rough outline of a tree was painted onto a large sheet of poster paper and each student dunked his or her hand into the paint and placed their handprints onto the tree. The teachers, including myself, contributed with the brown trunk, each kindergartener with the green leaves and the pre-schoolers with the grass. After drying in the warm spring sun the poster was placed on the wall to symbolize the growth of students as supported by their teachers. At the forefront of this activity it had disaster written all over it. All I could picture was 25-30 students running around soiling the walls, floors, furniture and each other with their goopy hands. Amazingly, the staff had this under control as if it were a science; one staff member manned the paints, another directed the tiny dipped hands to the tree, another immediately handed out paper towels to catch any dripping and a fourth guided the little Andy Warhols to the bathroom for a hand washing. This amazing choreography was a reoccurring theme throughout the day. Another such impressive instance was the staff’s ability to seamlessly transition the kindergarteners from one activity to another. Even though there was preparation that had to be done in-between each lesson, the kids were kept focused by singing nursery rhymes, seemingly ad infinitum. Had I been left alone to manage these kids, there surely would have been some disaster resulting in numerous parent-teacher conferences. Following the experiment in finger painting, we held a nifty adaptation of the old board game shoots and ladders. 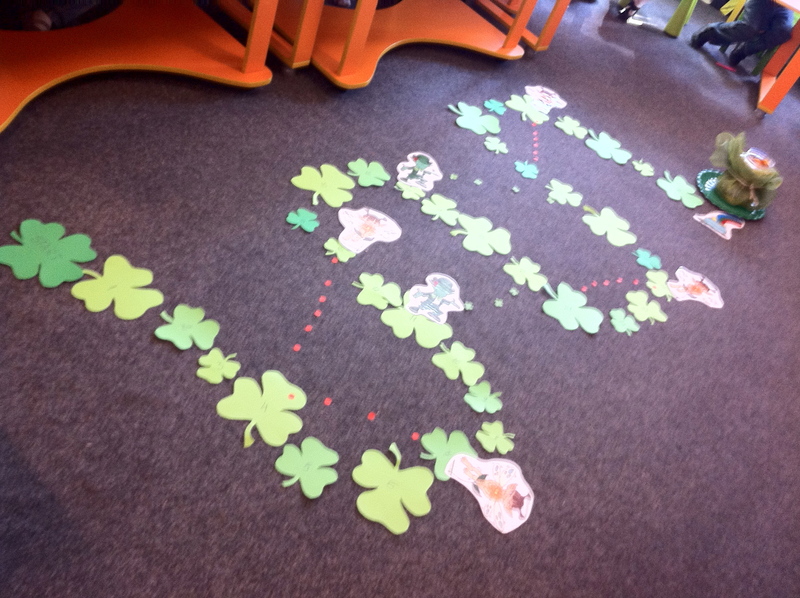 On the MES-English website, they offer a printable template that can be made into a board game themed with Saint Patrick’s Day. The idea being that all the students huddle around a tiny game board, roll little air passage clogging dice and move their characters through the course. In a stroke of genius, the Kindergarten Director adapted the game to make it life-size. She printed two-dozen or so four leaf clovers, a hand full of fairies and leprechauns and one large pot of gold, complete with rainbow. She then placed the laminated stepping-stones in an S-shaped pattern on the floor. Six students at a time were then picked at random, given oversized Lego pieces to serve as place holders and a largely fuzzy die was used to move the game forward. 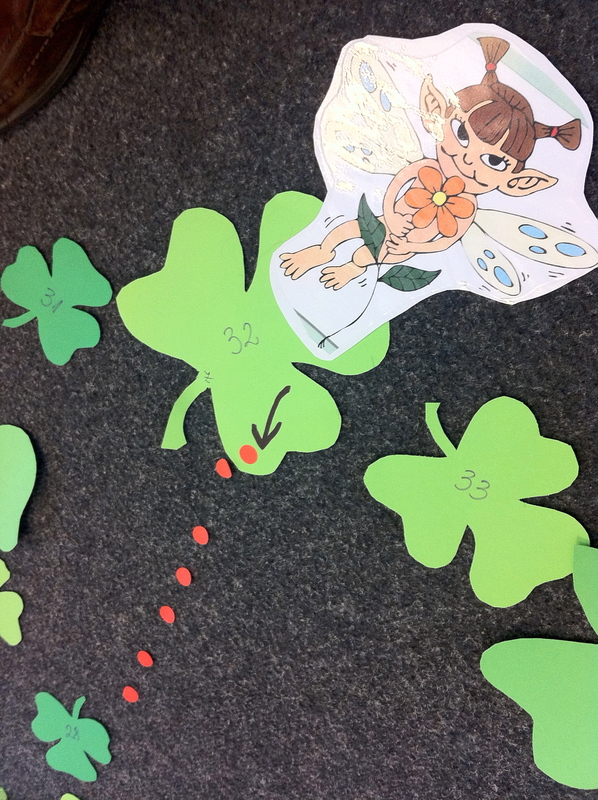 In turn each student rolled the die and moved ahead the number of four leaf clovers corresponding to the number on the die, some counting in English, some in Romanian and one kid in German. If they landed on a spot with a Leprechaun they would move up a ladder leading to an advanced spot on the board. However, if they landed on a spot with a Fairy they had to slide down to a spot a few spaces back. 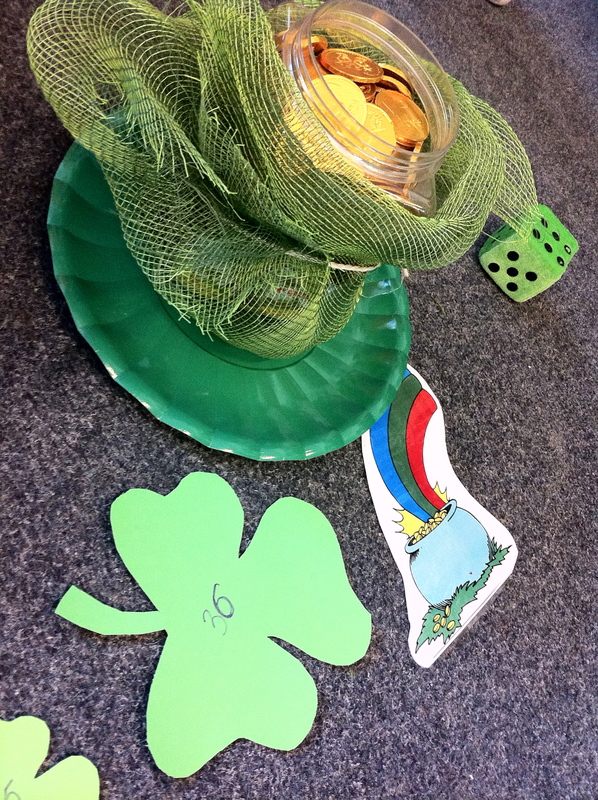 Each game resulted in a winner only if the exact number was rolled to allow the player the precise number of spots to land on the pot of gold at the end; I think this was a little harsh, isn’t everyone supposed to win in kindergarten? Regardless, I am happy to report that one of the two winners, to obvious overt schoolyard bragging rights, was, coincidentally, my counterpart’s daughter. A far cry from the spitballs, hormone-infused rowdiness and general apathy of high school, this experience at the kindergarten was a welcome and refreshing change of scenery. As the morning’s lessons came to an end and I prepared to return to high school for my afternoon class, we all filed out into the sunny front yard for playtime and a short break in the pleasantly warm air. I grabbed a seat on the swinging bench and was quickly joined by more little girls then could possibly fit next to me all at once. It was then that one walked up to me and whispered the following into my ear “Eu am un mesaj pentru tine: I love you Jeremy.” Needless to say, I made it clear to the Kindergarten Director that if she ever needs me for another cultural exchange session that I am only a phone call away.